There was no dabbling in precision technology for Bill Darrington. He researched, observed, picked the right system and jumped in with both feet. An AgLeader system allowed him to install and control row clutches or section shutoffs on his Kinze planters, Blu-Jet fertilizer applicator and Hagie sprayer and serve as a yield monitor on his Lexion combine. The Loess Hills Darrington farms create conditions that encourage and challenge precision technology. Fields with up to 20% slope that Darrington can watch dirt clods roll down have been sliced up by more than 120 miles of terraces. 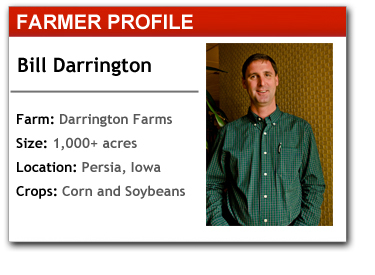 “We spend more time turning around than some people spend farming,” Darrington says. Planter boxes on his 16-row Kinze planters showed the benefits of row clutches the first season. The outside four planter boxes on each side would empty before the two sets of four inner planter boxes. While it was extra work to shift the seed around to get the planter boxes empty, overlap was clearly being limited. Not to mention not having corn fall down on the end rows at harvest time. Spotty satellite coverage on his hilly terrain and equipment drift that has limited auto-steer adoption are Darrington’s main precision issues. The rest, he and his dealer took care of up front. At his initial meeting with his service providers he laid out some important information and rules that he felt were necessary for his success with precision technology. What Farmers Want From You is a series of farmer profiles that examine the scope of precision farming tools individual farmers are using on their operation, along with the frustrations that can occur with adopting new technology and how dealers can alleviate those "points of pain" for farm customers. For the latest additions to the series, visit our What Farmers Want From You feed. He notes a lot of farmers pride themselves on knowing a little bit about everything and will nod their heads along when precision technology dealers start talking in industry jargon. 2. I need an off button. Darrington never wants technology acting up and keeping him out of the field. He insisted that there be a way for him to shutoff precision technology if it was acting up and still get fieldwork done. This was especially essential as his hilly terrain makes satellite contact a challenge in some places, resulting in glitches. 3. Understand what kind of customer I am. Farmers generally get precision technology for one of four reasons, Darrington says: productivity, simplicity, efficiency or ego. He says it’s the guy that purchases the technology because he feels left out of coffee shop chitchat that will be a dealer’s problem. People, like Darrington, who are passionate about using the technology are less likely to be upset if things aren’t going their way, he says. They might deserve a little priority treatment, like the final perk Darrington demanded. 4. Give me your cell phone number. This was a deal breaker for Darrington that his dealers gave into begrudgingly. He notes that as he settled into his new system during the first year that his dealers were excellent at coming out to deal with issues and walk through different functions. His next precision purchase will be the addition of auto-steer to his fleet.